We had Rabblers from London, Cambridge, Manchester & even some non-Rabblers. 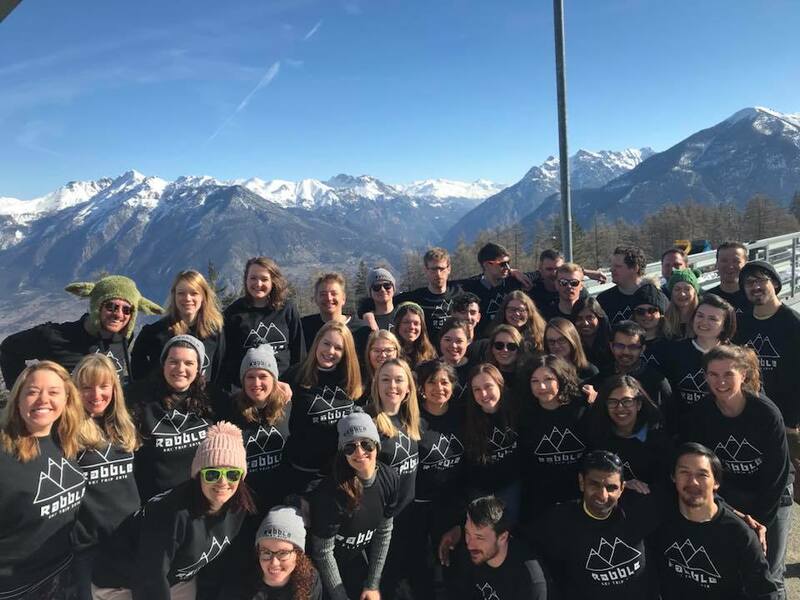 We arrived at Gatwick airport at a much more reasonable time this year (10:45am) After dishing out some sweet Rabble Ski Trip 2018 jumpers, it was straight into Wetherspoons to meet everyone. A couple of cheeky pints later and we were on our hour and a half flight to Turin, smashing out some Cards against Humanity in the back of the plane. Catch someone without their band on and nab your team some points. There were some team tasks, provided by Meghan, that we were to complete each day. Getting a group photo, Spelling out “Rabble” with people for example. So there was a real team-bonding experience there which made it so easy for everyone to meet each other. I’d like to say I made a lot of friends on this trip, I hope you did too. It was great to go with such a large group of different level skiers as there was always someone about to go out with. I rarely found myself unoccupied on the trip. 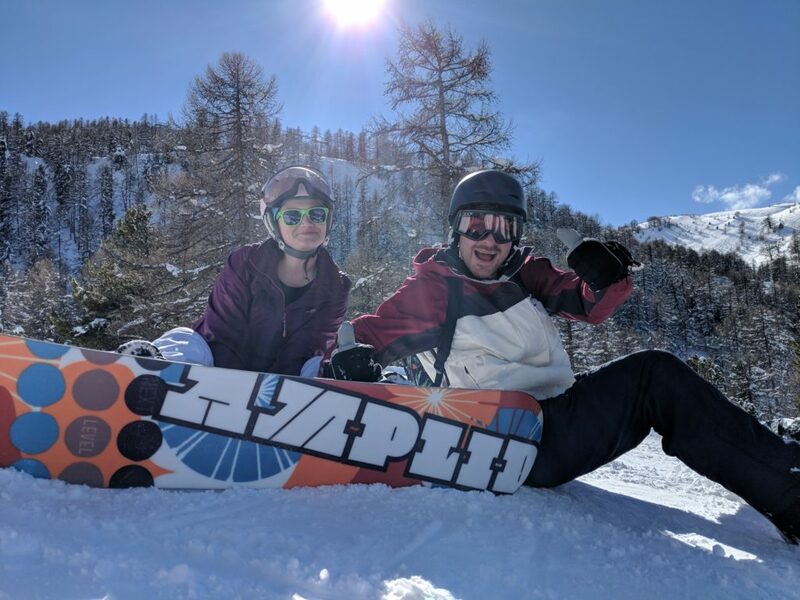 I could be trying some slopes with other newbies, in a lesson with my snowboarders, getting involved with the group activity of the day, lunching with everyone, hitting up the apres-ski, or just playing games in the hotel. Just going out with some of the newbie skiers a few days in was really cool. You could definitely see how much they’d improved. Having gone from not being able to put the skis on, to shredding some blue runs in a couple days was really, really impressive. Seeing the footage from the advanced skiers was amazing too. Seeing the super steep runs they were doing effortlessly was inspiring, but seeing them all wipe out just like we were was relieving. It’s just nice to know that everyone wipes out now and then no matter who you are. We were all just there to have fun at the end of the day, and that’s what we did. We also managed to squeeze in some Rabble up on one of the slopes a couple of days in (What kind of a Rabble holiday would it be without some Rabble games?). It was way more exhausting in the deep snow, but it meant you could jump and dive without fear, which yielded some really cool videos and point scoring moments. We had our fancy dress day on Wednesday, where we all dressed up as flamingos, which was amazing. You would just see a flock of flamingos speeding down a slope from up on the Ski lift and you just knew “There go some Rabblers”. Those who weren’t in the flamingo get-up were in fancy dress like Tigger onesies/ Pirate outfits. 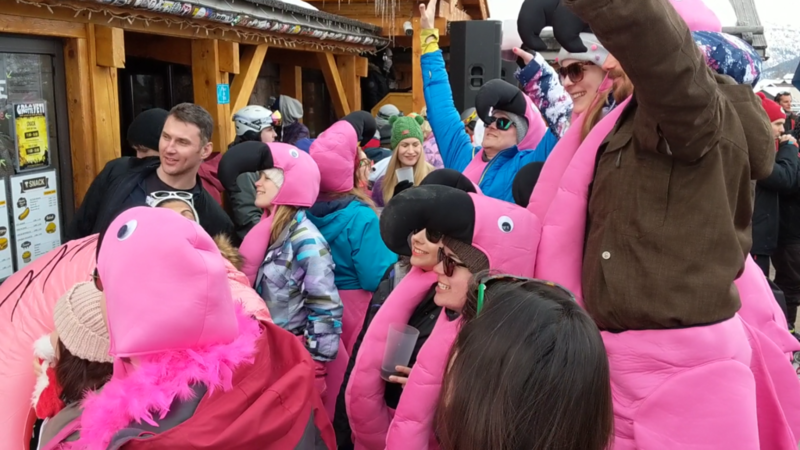 Apres-Ski on that day was hilarious as all the tables were pretty much taken over by flamingos. A few of us went out that night and we realised that by me being the youngest person there, Gavin was old enough to be my dad so he immediately jumped into the birds and the bees talk. 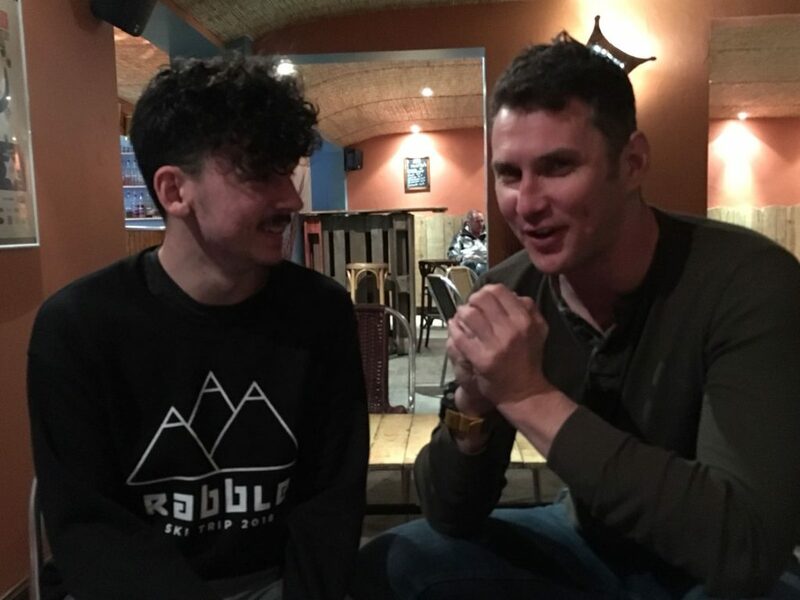 It was one of the most hilarious conversations I’d had. I never thought I’d learn so much. Thanks, Dad-Gavin! I was also able to introduce everyone to “Korean hand wrestling”. A game where you had to make your opponent lose balance, but you’re only able to touch palms. If you were wondering what that was on the trip, now you know. I think it’s safe to say that we all enjoyed the trip. It was a bit of a Rabble takeover. We came, we saw, we conquered. So thank you to each and every one of you who joined us!